The President of the United States takes pleasure in presenting the Distinguished Service Cross to Harry W. O. Kinnard II (0-5053), Lieutenant Colonel, U.S. Army, for extraordinary heroism in connection with military operations against an armed enemy while serving as Commanding Officer, 1st Battalion, 501st Parachute Infantry Regiment, 101st Airborne Division, in action against enemy forces in September 1944. Lieutenant Colonel Kinnard's intrepid actions, personal bravery and zealous devotion to duty exemplify the highest traditions of the military forces of the United States and reflect great credit upon himself, the 101st Airborne Division, and the United States Army. 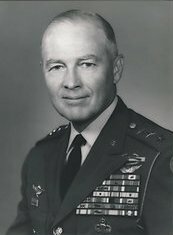 Lieutenant General Harry W.O. Kinnard II, who died January 5, 2009, at his home in Arlington County, was a West Point graduate whose decades-long military career stretched from World War II to Vietnam, but he was most often associated with one word that became instant legend. The word was "nuts," the reply to a German surrender ultimatum during the crucial Battle of the Bulge. General Kinnard, 93, died of complications of Parkinson's disease. In 1944, then-Colonel Kinnard was a 29-year-old assistant chief of staff to General Anthony C. McAuliffe, commander of the 101st Airborne "Screaming Eagle" Division. When the German army launched a last-ditch attack in the Ardennes Forest on December 16, the 101st was rushed into the Belgian town of Bastogne to defend the intersection of five strategic roads. Two days later, the division, outnumbered by more than 4 to 1, found itself surrounded by German tanks and infantry. The Americans were unprepared for fighting in the bitter cold and were pounded relentlessly by artillery. Their situation seemed hopeless. On December 22, the Germans sent two officers and two noncommissioned officers into Bastogne with a white flag and Lieutenant General Heinrich von Luttwitz's typewritten demand that U.S. forces surrender, the "one possibility" of saving American troops from "total annihilation." McAuliffe's instinctive response was to laugh and exclaim, "Us surrender? Aw, nuts!" He told his staff that he wasn't sure how to respond officially and asked for suggestions. "That first remark of yours would be hard to beat," Colonel Kinnard told him, and other staff members enthusiastically agreed. McAuliffe then called in a typist and dictated: "To the German Commander: Nuts!" and signed it, "The American Commander." The American soldiers who escorted the German emissaries back to their lines had to explain that "Nuts!" was the equivalent of "Go to hell." In the early morning of Christmas Day, the 101st Division repulsed a German assault. 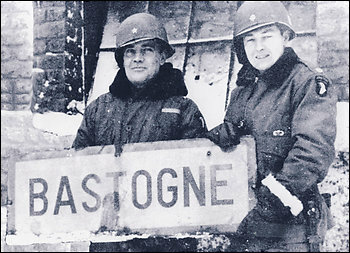 The siege of Bastogne ended when U.S. forces attacking from the south joined the 101st. Harry William Osborn Kinnard II was born in Dallas and was raised in an Army family. He graduated from the U.S. Military Academy at West Point in 1939 and was a member of the Hawaiian Division when the Japanese attacked Pearl Harbor on December 7, 1941. As a platoon leader in the 27th Infantry "Wolfhound" Regiment, he commanded a machine gun nest on Waikiki Beach in anticipation of a Japanese land assault. He parachuted into Normandy overnight on June 5-6, 1944, and took command of the 1st Battalion, 501st Parachute Infantry Regiment. He was battalion commander during the airborne invasion of Holland later in the year. After the war, he headed the Airborne Test Section at Fort Bragg, North Carolina. While at Fort Bragg, he was technical adviser on the war movie "Battleground" (1949), the Oscar-winning account of the 101st at Bastogne directed by William Wellman. General Kinnard was assigned to the Pentagon in 1958 and served at the National War College and as executive to the Secretary of the Army. 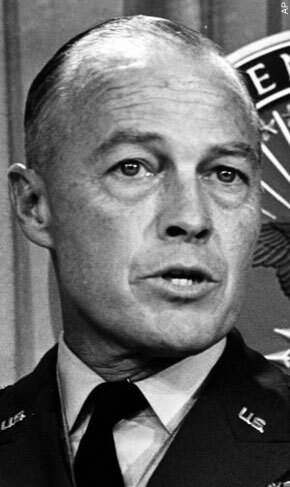 In 1963, he took command of the 11th Air Assault Division (Test) at Fort Benning, Georgia, and was credited with developing a quicker way of getting troops into combat. As commander of the First Cavalry Division (Airmobile) in November 1965, he led the troops in the Army's first major engagement of the Vietnam War, the Battle of the Ia Drang Valley. He later served in Vietnam as commander of 1st Field Force and as assistant Deputy Chief of Staff for Force Development. He retired from the Army in 1969. His awards include the Purple Heart, the Bronze Star Medal and the Silver Star. After his retirement, he was a consultant on Army aviation and served as president of the Army Aviation Association. In 1974, he was one of the first seven inductees into the Army Aviation Hall of Fame. He was a champion tennis player as a young man. He played golf into his 80s and shot his age at 82, 85 and 86. General Kinnard's son Bruce Kinnard died in 2007. His marriage to Eppe Ann Kinnard ended in divorce. Survivors include his wife of 25 years, Elizabeth "Libby" Kinnard of Arlington; five children from his first marriage, Susan C. Payson and Robert H. Kinnard, both of Prescott, Arizona, Kathleen L. Coursey of Stockton, California, Cynthia L. Harman of Lexington, South Carolina, and Harry W. O. Kinnard III of Gainesville, Florida; three stepchildren from his second marriage, Libby Nicholson of San Clemente, California, Janmarie N. Hall of Hamilton, Virginia, and Tom Nicholson of Augusta, Georgia; 16 grandchildren; and 15 great-grandchildren. Harry William Osborn Kinnard, Lieutenant General U.S. Army (retired) at the age of 93, died peacefully at his home in Arlington, Virginia on January 5, 2009. A soldier, leader and statesman, he epitomized the motto of his Alma Mater, West Point, "Duty, Honor, Country." He was born into an Army family on May 7, 1915 in Dallas, Texas. He lived an Army life of service to his country beginning with witnessing the attack on Pearl Harbor and defense of the island, then later parachuting into France on D-Day, commanding airborne soldiers in Holland and directing operations during the Battle of the Bulge with the 101st Airborne Division at Bastogne. After WWII, he continued to have a distinguished military career. In the early 1960's, he formed and tested a new type of Army division and after 2 years transformed and lead it into combat in Vietnam as the 1st Cavalry Division (Airmobile). This new Division set the standard for future U.S. Army airmobile operations. He ended his Army career as the Commander of Combat Developments Command at Fort Belvoir, Virginia in 1969. He received many high military honors, including the Distinguished Service Cross, and being knighted by the Queen of Holland for his actions in Holland in 1944. After his retirement he remained very active as a consultant and advisor. He was president of the Army Aviation Association of America and inducted into the Army Aviation Hall of Fame. He was president of both the 1st Cavalry Division and 101st Airborne Division Associations. He represented the President of the United States during the 50th Anniversary Commemorative events of WWII in "Market-Garden"ceremonies in the Netherlands. He is survived by his wife, Elizabeth Kinnard; three daughters, Susan C. Payson, of Prescott, Arizons, Kathleen L. Coursey of Stockton, California, and Cynthia L. Harman of Lexington, South Carolina; two sons, Robert H. Kinnard of Prescott, Arizona and Harry W. O. Kinnard III of Gainesville, Florida; two stepdaughters, Libby Nicholson of San Clemente, California and Janmarie Hall of Hamilton, Virginia, and one step-son, Colonel (retired) Tom M. Nicholson Jr. of Augusta, Georgia; sixteen grandchildren and fifteen great-grandchildren. His son, Bruce Kinnard, preceded him in death. Funeral services with full military honors will be held on Thursday, March 19th at 1 p.m. at Fort Myer Old Post Chapel. Interment to follow at Arlington National Cemetery. In lieu of flowers, donations can be made to Calvary United Methodist Church, Memorial Fund - Gen. Harry Kinnard, 2315 S. Grant St. Arlington, Virginia 22202.